Pounce and the Riddle of Fire is available now on Amazon as a Kindle book. The second story in the Battlementals universe stars a young Saber cub who undertakes a dangerous mission in order to gain his name of maturity and be fully accepted into his tribe. As you can imagine, a lot happens to him along the way. I don't want to ruin the story by telling you too much about it, but you can be sure that it has plenty of strange creatures and lots of laughs. During the first week of its release, you can grab Pounce and the Riddle of Fire for just $0.99. Click on this link and it will magically take you to the Land of Amazon where you can find the book. (Okay, it's not really magic. Just technology.) But let that stop you from plunging into the exciting world of Sabers as Pounce explores the Fire Lands. All weekend, I had the chance to visit with a lot of great people. There were plenty of parents who were excited to find a book that their boys were interested in reading. And of course, there were plenty of boys who were excited about reading Battlementals: Quest for the Harmonicon. Who wouldn't want to read a story that's a cross between Pokémon and Percy Jackson? The thing that amazed me though was how many teen-aged girls bought the book because Lucy told them about the monster that uses exploding snot to take out its enemies. Really? I thought it was gross when I wrote it. The second book in the Battlemental universe should be out by the middle of the summer . . . and it's free. That's right. FREE!. Just sign up for the newsletter and I will send you a link for a free download once it is done. And you should see some of the art that will be in it. Awesome! 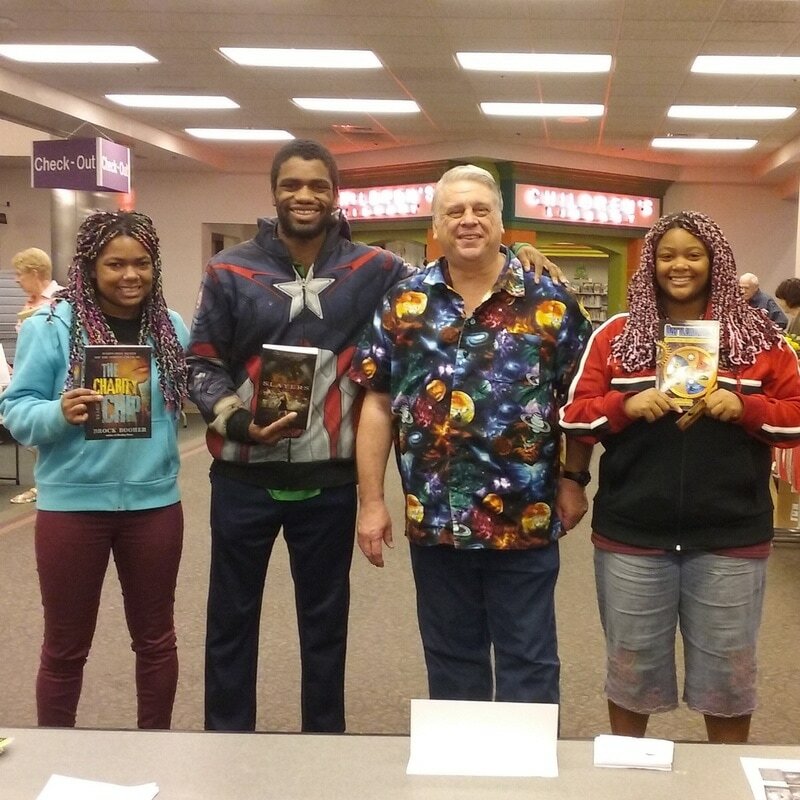 Last Saturday, I had the opportunity to participate in the Local Author Fair at the Red Mountain library in Mesa. All of the author events I attend are fun, but this one was special because I had the chance to see my good friendly Emily. Emily and her mother participated in one of my very first workshops and it has been a delight to see her and the rest of the family whenever I can. In the picture below you can see Emily, Quincy, me, and Meagan. Because of the developmental challenges they all face I’m super excited to see them interested in reading. Thanks for stopping by and visiting me, Emily, Quincy, and Meagan.